What is a "Missionary of the Gospel of Life?" It is a disciple of Christ who recognizes that the number one moral priority of our day is bringing an end to the massive child-killing taking place through abortion, and restoring the right to life to children in the womb! Moreover, such a disciple sees pro-life activity not just as a cause, but as a spirituality, and devotes him/herself to either full-time or part-time pro-life activity, in accordance with the spirituality developed by Priests for Life. Very simply, whatever pro-life work you are already doing can now be done in the context of the spiritual commitment of the Missionaries of the Gospel of Life. 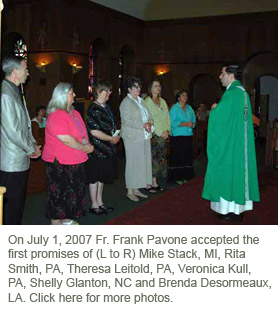 "Missionaries of the Gospel of Life" is a program of "Priests for Life,” which is the largest Catholic apostolate focused entirely on ending abortion. For some throughout the pro-life movement, there is a sense of isolation from the local Church, particularly when there isn't the leadership or encouragement that should be available at the parish level. Pro-life activists are sometimes made to feel like "outsiders." 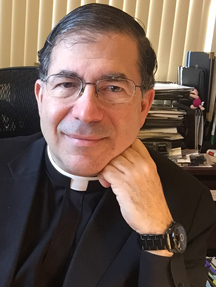 As a Missionary of the Gospel of Life, however, you will find more encouragement from priests and laity alike who are living the same spirituality. Missionaries of the Gospel of Life is a direct response to the call issued by Pope Saing John Paul II in Evangelium Vitae: “What is urgently called for is a general mobilization of consciences and a united ethical effort to activate a great campaign in support of life. All together, we must build a new culture of life” (EV, n.95). 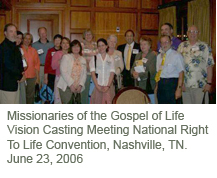 Missionaries of the Gospel of Life witness before the Church and the world to the priority of the right to life as the foundation of all other rights, and to the absolute claims to respect and protection that this right makes upon every individual and community in the human family. We promote and defend the natural human right to life, in the light of the Gospel, focusing in particular on ending the scourge of abortion. Missionaries of the Gospel of Life undertake a process of spiritual and pro-life development, and then make a public commitment to defend human life and to collaborate with other Missionaries by following our spirituality and sharing its mission to the extent that their duties allow. We participate in four overarching spiritual disciplines to nurture the spirituality and virtues that we teach. If a person wants to be a Missionary of the Gospel of Life, there is a period of discernment and study, after which, upon mutual agreement of the individual and our organization, a public commitment is made. The filling out of the online lay membership form is vital in confirming your interest in pursuing this call. You can also download this form in PDF format. Commit to saying the Prayer to End Abortion and the Pro-Life Prayer of Consecration each day. Study Pope John Paul II’s encyclical The Gospel of Life online by using the companion Study Guide from Priests for Life. Be sure you are subscribed to Fr. 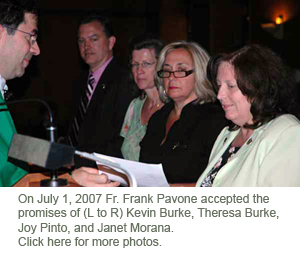 Frank Pavone’s bi-weekly column on the latest Pro-life issues and activities. Request it at subscribe@priestsforlife.org. You will be updated on the latest opportunities to assist you in discerning your membership in the Missionaries of the Gospel of Life! Our special email address for the Lay Missionaries of the Gospel of Life is missionary@priestsforlife.org. We have a great team who will assist you in becoming a Missionary of the Gospel of Life!